Large gauge ball closure rings and circular barbells are used in piercings that have been stretched or expanded over a period of time. Please note that due to their size these pieces of jewellery can be heavy depending on the material (Titanium is lighter that steel). JoBananas sell a large range of heavy gauge jewellery including Circular barbells (CBB or Horseshoe), Ball Closure Rings (BCR) as well as curved and straight large gauge barbells. We also sell large gauge segment or seamless rings that look like a complete circle with a hard to see segment that is removed for fitting. Sizes of our heavy gauge jewellery start at 2mm and we also sell 2.4mm, 3mm, 4mm, 5mm, 6mm and 8mm in most designs depending on what diameter or length your require for your stretched piercing. On our steel large gauge Prince Albert (PA) curved barbells we also offer a choice of ball sizes. We offer a wide range of materials for our large gauge jewellery, these include, plain steel, gold plated steel, Titanium (in a range of colours), Black PVD and acrylic. Our Titanium large gauge Barbells, BCR and Horseshoes we offer in a fantastic range of anodised colours. These are all coloured in house by ourselves and we offer - Highly Polished, Bronze, Brown, Blue, Ice Blue, Yellow, Gold, Rose Gold, Peach, Pink, Purple, Two Tone, Teal, Green, Rainbow and Oil Slick. 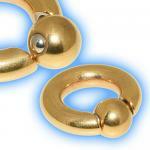 Wherever possible we like to offer internally threaded options for large gauge jewellery. Internal threaded jewellery has the thread on the ball or cone and this screws into holes on the main body of the jewellery. External threaded jewellery has the thread on the main body of the piece and this screws into a hole on the ball or cone. Advantages of an internal thread is the main body fits into a recess in the ball or cone and gives a neater finish with less areas where dirt and bacteria can collect. A further advantage of internal thread jewellery is that it does not tend to snag on the piercing when being inserted. It is important to remember that not all internally threaded balls and cones will fit any piece of internal jewellery so please check the description of the item you are buying or get in contact with us. These heavy gauge rings have an internally threaded post on the actual ball and are screwed into a hole on one side of the ring so when in place they look like a regular heavy gauge ring. These are hard to tell from a tradiitional BCR with a dimpled ball and are held very securely. The easy fit ball closure ring works by the ball having spring loaded domes that fit into dimples on either side of the ring horns. These are not as secure as a standard BCR crimp ball or screw on ball but still a good alternative for certain piercings. "Jewellery looks great quality and pretty for such a cheap price, delivered a day after order and the only tricky part of the whole process is..."
"Please with all the products , Like the way the ball screws right into bar , Delivery was very fast . Thanks pleased customer ;]"